We like them so much that we have started eating them every week. It’s a delicious ritual. Pancakes are pretty phenomenal, aren’t they? 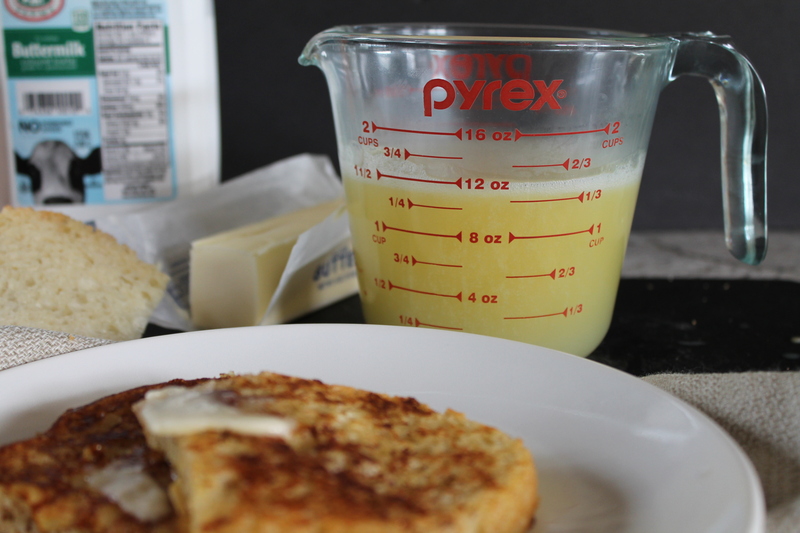 Do you know what makes pancakes more phenomenal (if you are 3 years old)? And…sshh…do you know what makes them more phenomenal if you are 30 years old? Using Greek yogurt for a little protein, and raw honey instead of refined sugar. Because a sugar crash isn’t pretty, no matter how old you are. 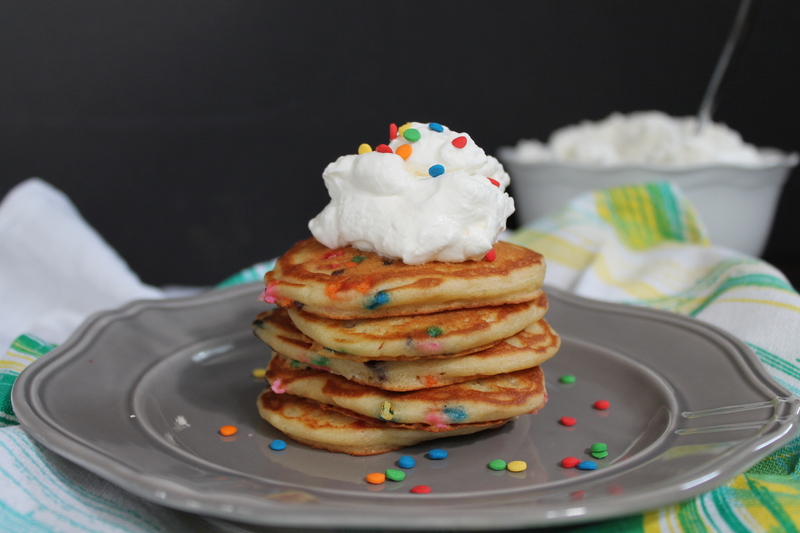 I absolutely love these pancakes! I feel like the sprinkles are smiling at me. In fact, this may be the first time in my memory that sprinkles have actually improved a food for me! I might have to make sprinkles a habit. I can remember the first time my mother ever added chocolate chips to pancake batter. It was basically the best thing that ever happened to Sunday morning breakfast, as far as I was concerned! 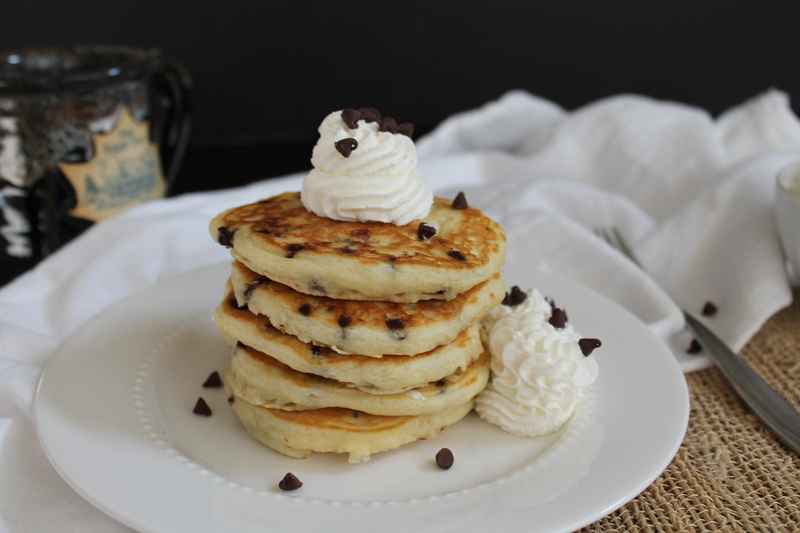 In the intervening years, I have eaten more than my fair share of chocolate chip pancakes, and my conclusion is that nothing competes with homemade! Homemade pancakes land on my plate when they are just warm enough to melt the whipped cream, of which there is never a shortage (I will try not to judge you if you are crazy enough to put maple syrup on chocolate pancakes, but I am all about the sweet cream), and the pancakes are always just chocolatey enough to satisfy my sweet tooth without sending me into a sugar coma. Basically perfection. 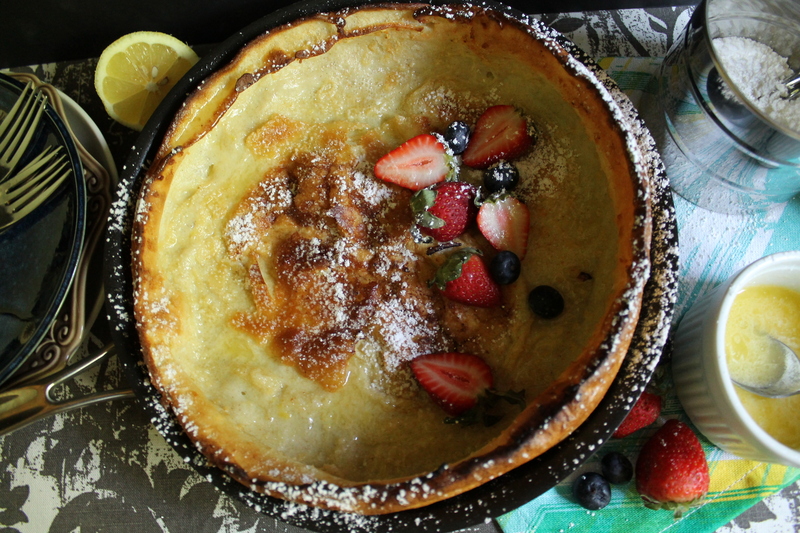 Pancakes have been one of my major cravings during this pregnancy, so it seemed fitting to share a delicious pancake recipe with you during the final days before my little daughter is born! It was Mother’s Day a few weeks ago. Not to brag, but I had a pretty stupendous day! I should probably backtrack and mention that my husband isn’t big into celebrating special occasions and events, or at least that he doesn’t care whether holidays are celebrated on time. He is more of the mind that a birthday is just a day, Christmas is just a day, Mother’s Day is just a day… And in a way, he is totally right—but I do love celebrations. I love the magical feeling and the pageantry. I love thinking about how all the prep is going to turn into something memorable. I love the memorable moments. So. Guess how Dave decided we would celebrate Mother’s Day? He got up early and made me breakfast! In fact, he made me two breakfasts, because he did a trial run a few days earlier to make sure that Mother’s Day would be perfect. I got to choose the meal, and I racked my brain for something delicious but not too indulgent, simple but not boring. And I came up with a Dutch Baby! A Dutch Baby is like a cross between a pancake and a popover. Topped off with lemon butter and powdered sugar, it is tart and sweet and a little doughy and, really, just everything a mom could hope for on Mother’s Day. We liked it so much that I made it again a few days later, just so I could share it with you! What you need is for your kitchen to smell warm, and your stomach to be filled with sweet spices to keep you cozy from the inside out. So let’s break open our spice cabinets and make chai pancakes! We could maybe even pretend that all those healthy anti-inflammatory and blood sugar–lowering spices make these pancakes somewhat healthy. 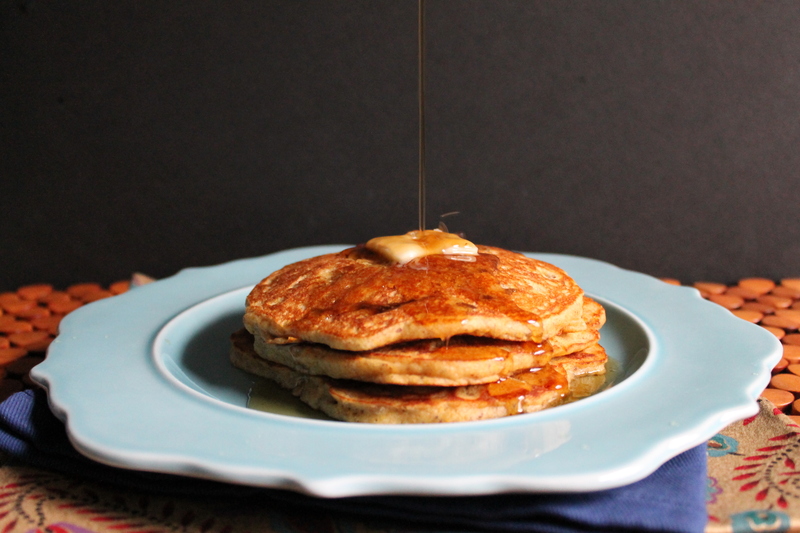 But however you choose to rationalize making pancakes and whipped cream in the middle of January (hey, we can’t restrict ourselves too much based on all those healthy eating resolutions!…otherwise we will crash and burn), you should definitely add these pancakes into your weekend breakfast rotation. 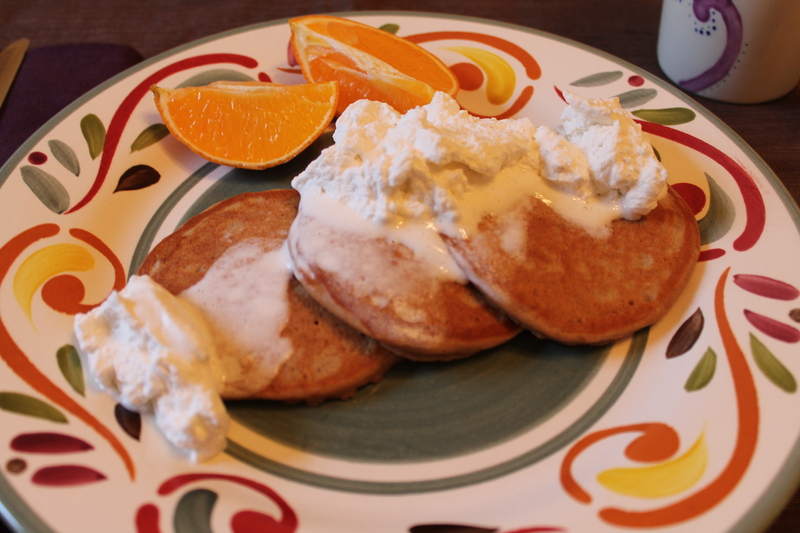 This month for the Secret Recipe Club, I was assigned a great blog: Amy’s Cooking Adventures. She has so many delicious recipes that I really had a hard time deciding what to make! So many of Amy’s dishes looked yummy, from her Avocado and Egg Grilled Cheese to her Balsamic Pasta Salad. 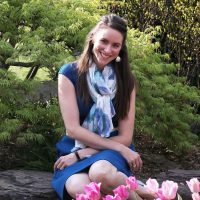 I am definitely looking forward to making several of the recipes from her blog, but I could only choose one to post for the Secret Recipe Club challenge. 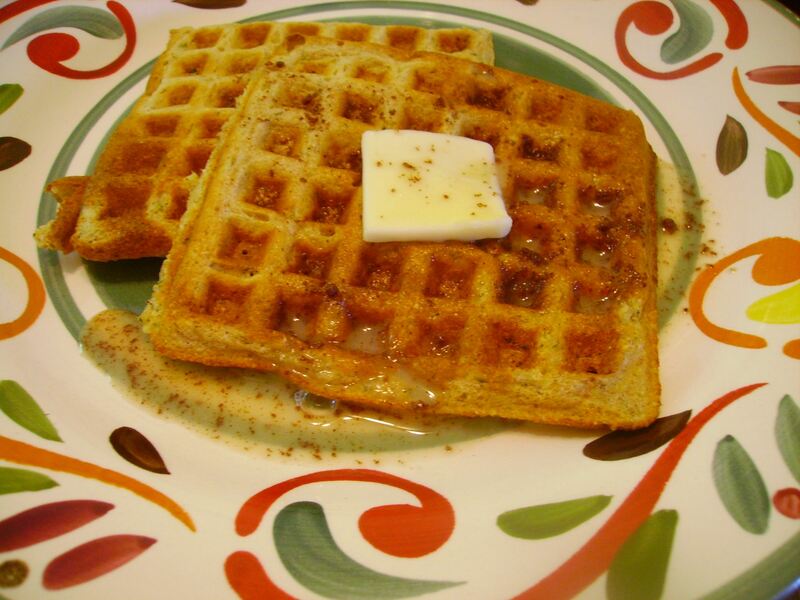 The flavor of these waffles is fantastic, a little nutty from the whole wheat, but still light because of the zucchini. Not too sweet, with a hint of cinnamon. 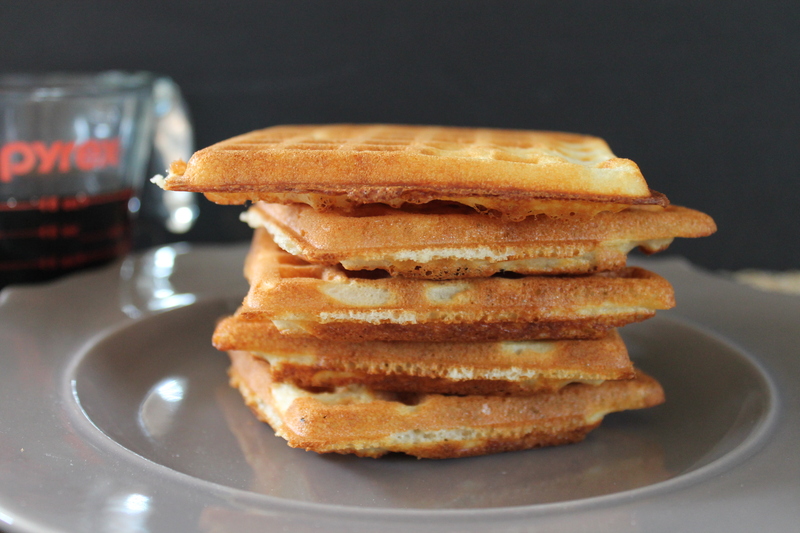 While waffles aren’t exactly the quickest breakfast treat to make, I will definitely be making this recipe again in weekends to come!